This is the first post in a new DRG series, “Hot Dudes Doing Cute Things.” The content in this series should be pretty self-explanatory. Admittedly, it's not a very eloquent title, but sometimes words are not important when the meaning is so great. For my first handsome gent doing something adorable to get all the ladies’ hearts a-fluttering, I give you Marlon Brando. Let’s be real, no matter how bloated and crazy he became in his later years, young Marlon Brando (circa the 1940s to late 1950s) was a stone cold fox. His foxiness during this period makes the less-foxy years that follow seem more acceptable because at least the world was graced with such unbelievable swoon material, if only for a short flicker of time. Need proof? There’s a popular theory held by many Brando fans – and it's one that I’ve said on DRG before – about his early career: you watch A Streetcar Named Desire to fall in lust, but you watch On the Waterfront to fall in love. That is one of the most monumentally true statements that I have ever heard in my life. Compare Marlon’s iconic ‘STELLAAA!’ scene in Streetcar to the moment in Waterfront when he is trying to break down Edie’s apartment door. 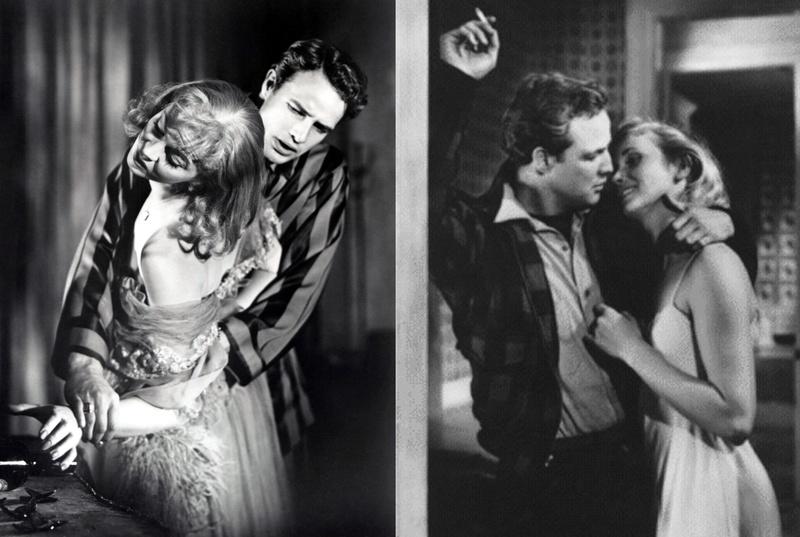 Both are similar in terms of context – Marlon’s character has screwed up and is trying to make amends with his love (in Streetcar because he was drunk and beat his pregnant wife, in Waterfront because he unintentionally set up his girlfriend’s brother to be murdered) – as well as in emotional intensity (in both scenes, Marlon is acting with extreme passion, literally screaming in pain to make his love understand and forgive him). But there is difference in how you as a viewer feel about him, and I think it’s to do with Marlon’s mannerisms and general attitude in each respective role. 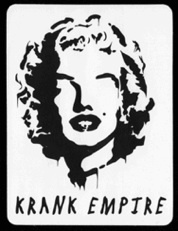 There’s an animalistic quality to Stanley Kowalski. I know it’s been written to death that Stanley is a brute, a primitive creature, an uncivilized, drunken abuser, but there are elements of truth in that regardless of if you see redemptive qualities in him. When Stella comes down the stairs to rejoin her pleading husband and they move together off-screen, you know exactly what they’re going into the house to do. Okay, yeah I got a bit diverted there. So despite Terry’s evident idiocy, his past as prizefighter (where a successful day at work would be to make his opponent more bloodied and concussed than he was), and his connections to a brutal and corrupt mob -- he’s much kinder and gentler than Stanley Kowalski. A kiss from Edie is enough for Terry, whereas Stanley isn’t even contented by one woman (re: when he drunkenly attacks Blanche when Stella is in the hospital giving birth to their child). Just look at him being all beatnik-y on his typewriter and all homebody-y with his cat. Seriously, how adorable does Marlon look with this cat? Answer: very. 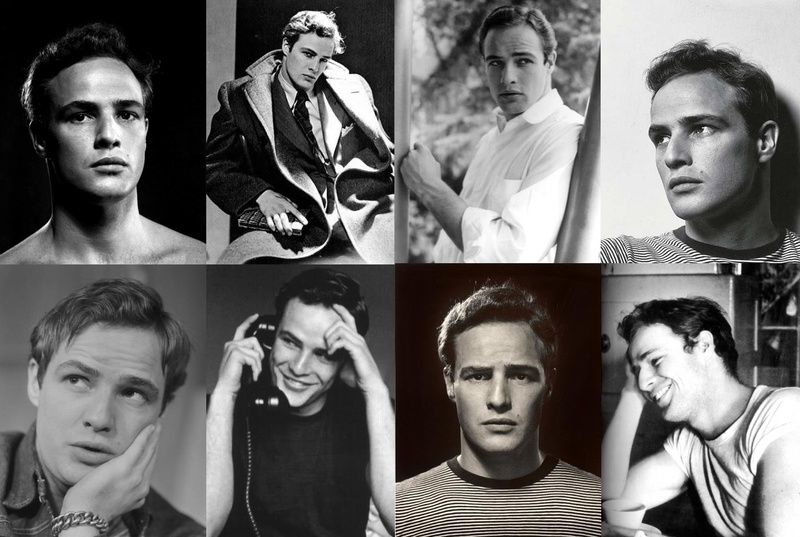 I’ve seen these pics many times before but looking at the Buzzfeed article, appropriately entitled “Marlon Brando Was A Perfect Man,” put me back into turbo-swoon mode. Honestly, there's no better to begin the "Hot Dudes Doing Cute Things" series than with a guy who was known for being all brooding and smoldering and mumbling like Brando playing with a freaking kitten?! 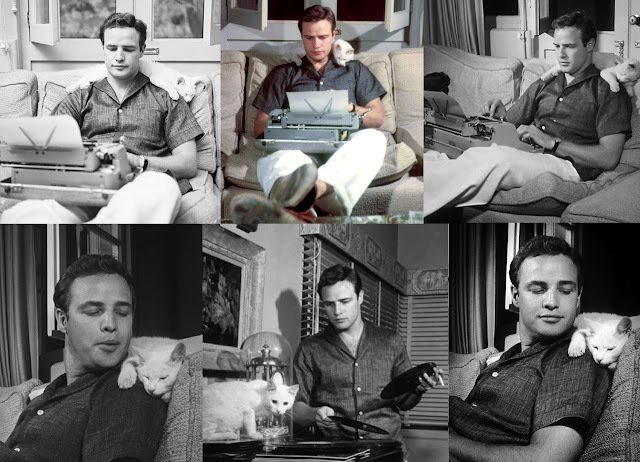 Historical truth: Marlon Brando loved cats (remember the famous moment in The Godfather when he’s petting the kitten? Yeah, that wasn’t originally written in the scene. They found a stray cat roaming around the studio lot and it was added to the scene at the last minute). Here's a total squee-inciting tidbit -- he once said of his relationship with his feline pet, “I live in my cat’s house.” Yup, that is tremendously precious (and this is coming from someone who isn't even obsessed with cats!). Want more of Marlon-feline goodness? Watch this video of the actor meowing in Streetcar looped over and over again for a minute. Love it - thank you! I'd like to request Jakey-cakes Gyllenhaal and his love of dogs for this series. YES! PETER O'TOOLE! He did so many cute things! And was extremely handsome. Please do that! Sarah - Jake is the perfect candidate, yes! He does so many adorable things and weird-but-so-odd-its-adorable things (like that series of photos where he was laughing animatedly at his salad and sandwich) that it would be criminal not to include him! I'll definitely have to look up Jake & his dog though, because I'm a bit unfamiliar. Anonymous - Peter O'Toole. Y-E-S. That's definitely happening. Great suggestion! I'm gonna start my research (i.e. just Google-ing photos of him for several obsessive hours) right now!